Have Socialists Infiltrated the Georgia Senate Democrat Caucus? Socialism is called a theory because, in theory, socialism works. On paper, socialism looks good. It feels good. And, it sounds good. Putting people over profits just sounds good. People working together for the common good; that's a great slogan to put on a bumper sticker. In practice, however, socialism does not work. Socialism does not work because it requires a person to abdicate their individual rights in favor of society's collective rights. Joseph Goebbels, Propaganda Minister for the National Socialist German Workers' Party (the Nazis) reputedly said, "To be a socialist is to submit the I to the thou; socialism is sacrificing the individual to the whole." Ask the Germans how well national socialism worked for them. Socialism does not work because socialism rewards mediocrity and punishes success. Socialism is the government saying no matter how hard one person works, they get the same house and the same car as the person who: A.) doesn't work; B.) does very little work; or C.) does piss-poor work. Why? Because under socialism, if the government decides it is in the best interest of society for everyone to have a house and everyone to have a car, everyone gets a house and everyone gets a car regardless of whether they worked for it or not. As a result, there's little incentive for the individual to succeed. That's socialism, and that's why it doesn't work. There are some who disagree with the assessment I just provided. There are some who still believe, despite its repeated failures, that socialism works. These folks launched a local Atlanta affiliate of Socialist International, called the Metropolitan Atlanta Local Democratic Socialists of America. These local Democratic Socialists of America believe democracy and socialism go hand in hand. These socialists believe private corporations should be brought under government control. They openly advocate for a radical transformation of the government and the economy. And they say a long-term goal of socialism is to eliminate all but the most enjoyable kinds of labor. They're Democrats. They're socialists. They're nuts. And they have supporters. The number three Democrat in the Georgia Senate, Vincent Fort, is featured prominently on the Metropolitan Atlanta Local Democratic Socialists of America webpage. Fort was honored by the same socialist organization, in 2008, with their top award. 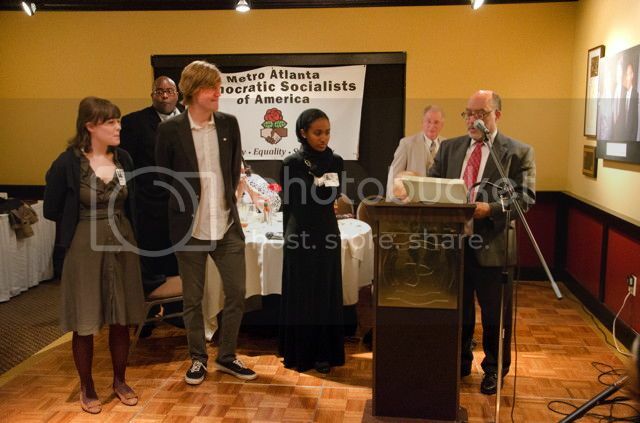 Another Senate Democrat, Nan Orrock, received honors from local Atlanta socialists too. The Georgia AFL-CIO, and many of its affiliates, bought ad space in a program for the 2012 socialist award dinner. The same Georgia AFL-CIO that gave hundreds of dollars to many Democrats in the state Senate is the same Georgia AFL-CIO helping to fund a socialist group. Have socialists infiltrated the Georgia Senate Democrat Caucus? Is state Senator Vincent Fort, the Democrat Whip, a socialist? Is Senator Nan Orrock a socialist? The Georgia AFL-CIO, a group that donates dollars to socialists, gave money to quite a few Democrats in 2012. Are we to presume that these Democrats supported by the AFL-CIO are socialists too? These are all good questions needing answers. Next year, Democrats will fan out across Georgia in an attempt to become the majority party in this state. If Democrats want to lead, it's important that voters know whether these Democrats are socialists who want government to seize private businesses, seize private property and eliminate the rights of the individual.